Erie County organizations have made significant progress over the last year toward our community’s goal of creating a thriving, educated, green, livable, and connected region. 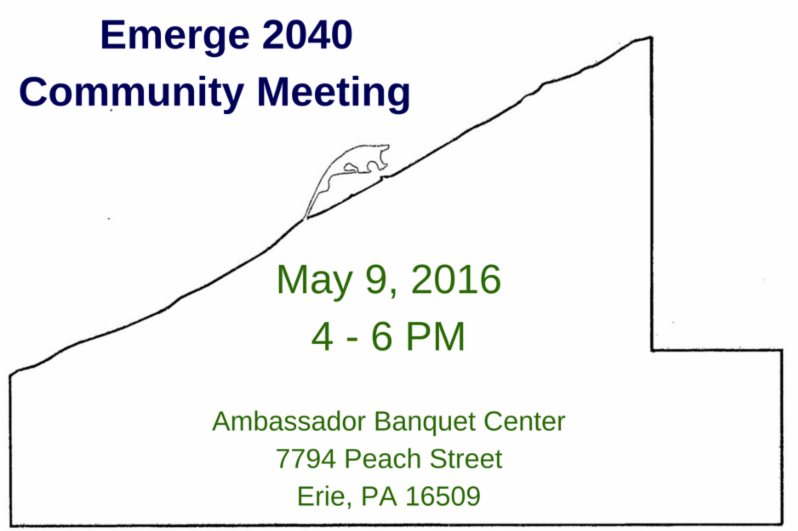 Join Emerge 2040 on May 9th to celebrate a year of the community’s accomplishments and look ahead to our future. The event will include remarks from the Honorable Dennis M. Davin, Secretary of the Pennsylvania Department of Community and Economic Development (DCED). Participants will also have an opportunity provide feedback and discuss ways we can all contribute to achieving our region’s vision. In the last year, has your organization contributed to moving Erie County forward toward the community’s vision? Using the link below, please tell us how your work is helping to advance progress toward the community’s goals as reflected in the Destination Erie Plan so that your achievements are included as part of this celebration of progress. Please answer a few brief questions about your work here.